Stepping pressure against five major industrial corridors sought to be built by the Government of India -- Delhi-Mumbai, Amritsar-Kolkata, Vizag–Chennai, Chennai–Bangalore and Mumbai-Bangalore, a high-level meeting of several people's organizations have decided to begin a Corridor Virodhi Sangharsh Abhiyaan in October, which will undertake a nation-wide yatra preceded by regional meetings. Senior activists of National Alliance of People’s Movements (NAPM); Indian Community Activist Network; Sarvahara Jan Andolan; Jan Sangharsh Samanvay Samiti; Mines, Minerals & People; and Delhi Solidarity Group, participated in the two-day conclave, which took place in Delhi. “How can the fate of people in this country be deciding on the growing web of industrial corridors in the country today is an undemocratic ploy to take away the sovereign rights of the people and its public institutions”, she wondered. 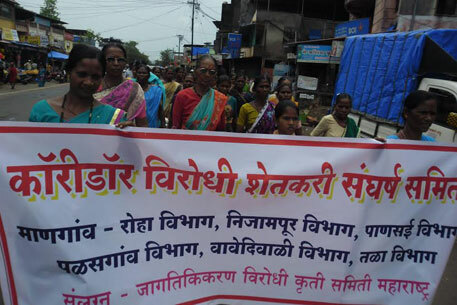 “It is the financialisation of economy in favour of big corporations that is being facilitated by the government with active help from the governments of Japan, Singapore, Hongkong, UK, Germany, US or other developed countries who are exploring the possibilities for expansion of their own corporations”, insisted Anil Chaudhary of the Jan Sangharsh Samanvay Samiti. “Contrary to the image that land acquisition in Gujarat is easy, it is one of the most difficult places to acquire land in the country. Likewise, as against the claims of creation of jobs, Gujarat, despite numerous special economic zones (SEZs) in the past decade has created the fewest jobs”, he added. In a statement, the conclave activists said, the development of the five together “have an influence area covering 50% of the land area”. “Together with the Sagarmala, Bharat Mala projects, the Industrial Corridors are a massive infrastructure plans.” Yet, there are no plans for “comprehensive social and environmental impact assessment” regarding “millions of people dependent on the natural resources, farmers, adivasis, fishworkers, artisans, pastoralists”, it added. “Projects and plans are being prepared by consultants and to be implemented by special purpose vehicles and specially appointed authorities, which override powers of Gram Sabha, Gram Panchayats, municipalities and municipal corporations”, the statement said. The statement also demanded abrogation of “the labour and land laws brought in by the Rajasthan and Gujarat government", calling them anti-democratic and anti-constitutional, asking the President not to give assent to them.